It can be difficult to learn and grasp complex theories of psychology and behaviorism from a textbook in a classroom. However, take those same concepts and approach the material through a hands-on project involving a living, breathing animal and soon the complexity dissolves into understanding through direct application and practice. Southern Utah University is turning textbook theory into experiential learning through one of the nation’s few pigeon labs. The lab is used specifically for teaching undergraduate students principles of behaviorism by providing live pigeons for each student to train as part of the course. Kaleb Ware, a sophomore psychology major from Grantsville, Utah, provides an inside perspective on this unique class and lab. 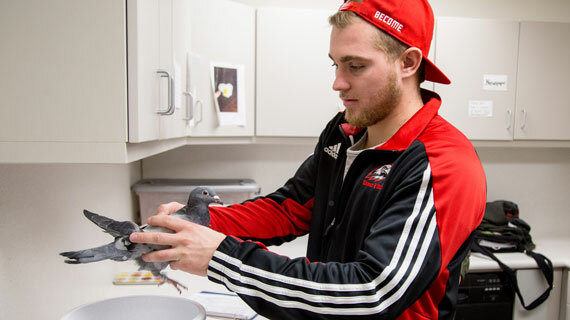 Before meeting their pigeons, students are taught the ethical standards of working with live animals and are walked through the expectations of day-to-day care of their bird. Each student is assigned a partner and together they are responsible every day for cleaning, changing the water, weighing and feeding them, and taking them out of their cage. Dr. Corser, chair of the psychology department and professor of the course, frequently emphasizes the importance of being ethical and recognizing that the students have complete power and control over their pigeons and they should never abuse that power. “Students are trained to care for the birds according to strict and ethical standards of animal care and are held accountable to those standards,” said Corser. Once the lab portion of the course begins, students introduce their pigeons to the “Skinner Box” named after a famous behaviorist B.F. Skinner who was best known for his operant conditioning techniques. The box is metal but has glass panes so the researcher can see inside. On the wall of the box is a plastic disk about the size of a quarter. When pecked, this disk causes the “hopper” to make food available to the pigeon for a few seconds, then falls back out of reach. The hopper can also be manually activated by a button held by the researchers. According to Ware, the first few days in the Skinner Box are spent teaching the pigeon to peck the disk. This is done by doing something called “shaping” which involves reinforcing behavior that is getting closer to what they are aiming for during the beginning stages of training. For example, they may reinforce the pigeon if it pecks near the disk even if it doesn’t get it the first few times. The disk can also be adjusted to turn red or green so that the pigeon can learn to distinguish between colors. As the semester progresses, lab assignments become more complicated as different concepts of reinforcement are applied and studied. Corser has come to appreciate the caliber of students he gets to work with and the unique opportunity they have to learn in this setting. In a course with so many possibilities, Corser is quick to involve his students in the process of determining the direction of the class. Every semester, students marvel at the types of things a pigeon straight off a local farm can be taught through principles of reinforcement. From bobbing their heads to the beat of a song to spinning in circles when they see a certain color, there’s no end to the types of things students can teach their pigeons when principles are applied correctly. Ware plans to attend medical school following graduation and pursue a career as a psychiatrist.